The Story: A stoic bounty hunter transports a fugitive whose vengeful brother is coming after him. Along the way, he takes on two more bandits and a station master’s wife. Each has hidden hurts and secret agendas which will put them all on a collision course. How it Came to be Underrated: Boetticher’s movies were hidden in plain sight in America, disguised as “B-westerns”, which allowed him to have the creative freedom he wanted, at the expense of critical recognition. They were beloved in Europe but largely forgotten over here, so they were never available on VHS, but they’ve been rediscovered over the last 15 years and finally have excellent DVDs. American are having bitter thoughts today about the downward spiral of revenge that has consumed our last ten years. In Boetticher and Kennedy’s world, there is no good or evil, just an endless ledger of old grievances to be settled, or not: The only choice they’re allowed to make is between vengeance and forgiveness. Neither is fully satisfying, but only one allows you to have any kind of future. Most movies from ‘55-’65 suffer from the same curse: ultra-widescreen cinematography. Like 3-D today, the novelty of the gimmick caught on like crazy with the public, but it was a fundamentally misconceived idea. Boetticher was one of the few who knew how to maximize the value of the expanded real estate. Look at the way this composition allows the foreground elements to interact with the far distant background, turning hundreds of miles of landscape into one tense interaction. Boetticher’s eye for talent was amazing. Not only did he perceive hidden depths in old standbys like Scott, but he was among the first to spot the flinty-eyed power of Van Cleef, Coburn, Roberts, Lee Marvin, Richard Boone and many other names who would soon go on to be big stars. Boetticher’s “get ‘em before they’re famous” approach allowed him to have A-list casts for C-list budgets. How Available Is It? : The gorgeous DVD has an introductory video essay by Martin Scorsese (who also praises this movie in his Personal Journey Through American Cinema) and a lively, in-depth commentary by Boetticher expert Jeremy Arnold. 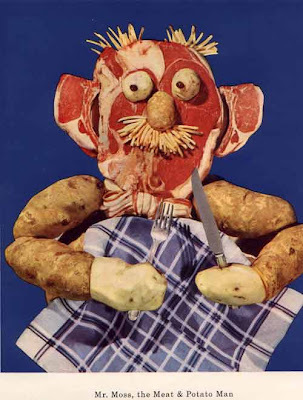 Today’s Post Was Brought To You By: Meat and Potato Man! Don't have much to add because you really get the greatness of this film and you mention all the other Boetticher masterpieces too. Budd Boetticher is like the Jean-Pierre Melville of American Westerns. He pares the style and substance of the genre down to its bare minimum and out of that extracts essential visual and narrative truths that resonate more than most of the better known classics. These Westerns are excellent examples for all low-budget filmmakers, lessons in how you can do more with less, how to turn limitations (of locations, actors, money) into strengths and to make great looking and compelling films on the cheap that don't feel cheap for one second. Meat and Potato Man brings nothing but terror. Frank: It's me you're after, Brigade. You've got no quarrel with Billy. Ben Brigade: What quarrel did you have with her? Frank: That was so long ago, I'd almost forgot. Ben Brigade: A man can do that. DAMN. THAT IS COWBOY DIALOGUE.